For the ultimate Tampa Bay experience, take to the skies on a helicopter tour and see the key highlights of the region, including downtown Tampa, Fort De Soto Park and the Gandy Bridge. Start by flying over the mansions of Davis Island before circling downtown Tampa’s skyscrapers. Admire the aerial views as you pass by sights such as the St Petersburg Times Forum, University of Tampa and the Tampa Bay Aquarium. Then head south to Fort De Soto, a park made up of five islands, and pass over the Gandy Bridge along the way. On your way back, fly over St Petersburg, Hyde Park and the Sunshine Skyway Bridge. Take to the skies for exclusive aerial views of St Petersburg and Tampa Bay on this comprehensive helicopter adventure. From the Peter O. Knight Airport, your pilot will first whisk you above the mansions that dot the coastline of Davis Island. Then make your way north to downtown Tampa, where you will hover just above the skyscrapers for a truly unique Tampa experience. Next, pass by Tampa sights like the St Petersburg Times Forum, Tampa Bay Aquarium and the University of Tampa. Your pilot then takes you to Fort De Soto, a scenic park located just off the southwestern coast of St Petersburg. 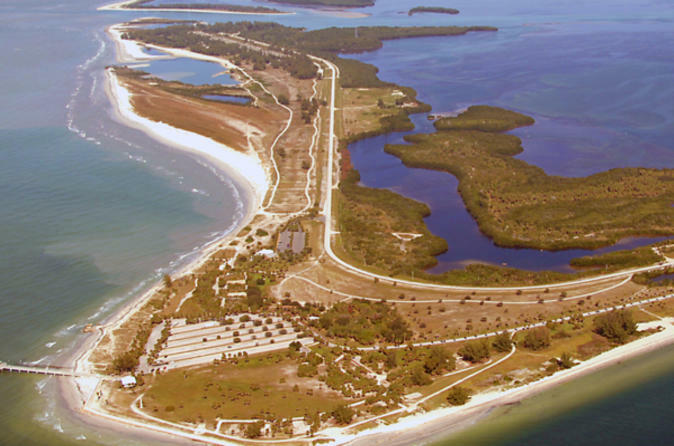 Fort De Soto Park is made up of five islands: Madelaine Key, St Jean Key, St Christopher Key, Bonne Fortune Key and the main island, Mullet Key. On the return journey to the airport, pass over beautiful St Petersburg, the Sunshine Skyway Bridge and Hyde Park.